This tutorial is about downloading and using Picture frames. I had a problem with the first 4 pages as they wanted to load into my Photoshop and not PSP but if you only have the PSP it should be fine. 1.Choose which frame you want in your collection,then Click OPEN. This will open the frame up in your PSP. It's now saved in your frame collection. You'll find your new frame in your collection. Use the drop down arrow to choose the frame you wish to use. Every choice you make will be seen in the preview pic. Now goto IMAGE..RESIZE..If the pic needs resizing. It's because the dress has so many diffent shades of the same colour that makes it hard to select everything. Yes I say a GREAT BIG THANK YOU to you Essex Boy for all the work that YOU have done for us, here. I am computer illiterate and no way could have learned all of this from reading the help files. You are great, maybe somehow, we can think of something nice to do for you and your family. Once again thank you and many blessing to you and all. This tutorial is to make a cool underwater sea signature pic. 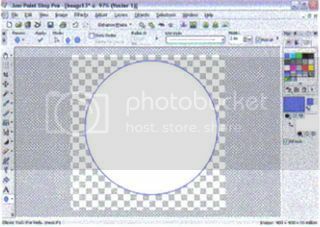 First open a new image 400 x 400 and make it transparent. 1.Now make the BACKGROUND and FILL PROPERTIES..White and the FOREGROUND and STROKE PROPERTIES..Blue. Now goto the SHAPE TOOL. It's the one under the text tool,then choose ECLIPSE from the drop down menu. then draw a large oval/circle. This is the sort of thing it should look like. 3.Now click in the FOREGROUND and STROKE PROPERTIES. 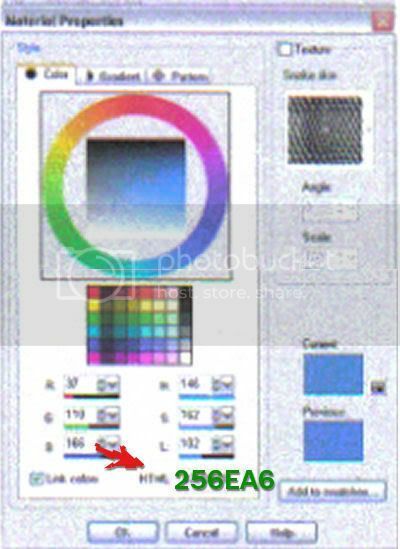 Click the GRADIENT tab,then select DUOTONE LIGHT BLUE. The Style should be on the first one,and make the angle 0 and repeats 1. Then select the FLOOD FILL TOOL,it's the one above the text tool. Then left click it inside the oval shape to fill it with the colour. 5.Now goto LAYERS..NEW RASTER LAYER. Now is when we add the sea animals. I'm using the dolphin in the picture tube. If you dont have a dolphin in yours you can use this pic. 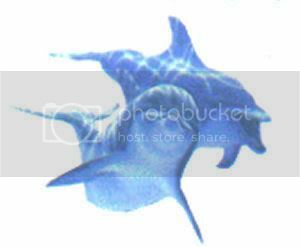 To use that two dolphin pic right click on the pic,then copy the image. then GOTO ANIMATION SHOP 3. Paste the image as a new animation. Then goto FILE..EXPORT FRAMES TO PAINT SHOP PRO. Now go to the pic which is now in PSP. Name the tube then click OK.
6.Now click on the PICTURE TUBE TOOL. Use the drop down arrow in the top left hand corner. Find the picture that you're using as your picture tube. Change the setting to make the tube smaller I'm using 30. Now click on the RASTER DEFORM TOOL,It's under the hand. Use that to move around the dolphin to the way you want it in the picture. Then click on the MOVE TOOL to deselect. 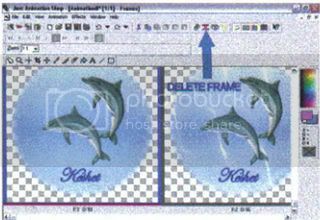 If you want another dolphin pic inserted goto LAYERS..NEW RASTER LAYER. 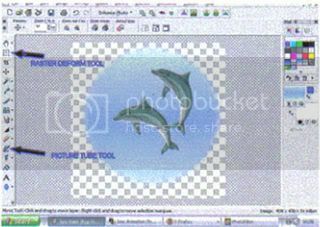 Goto the picture tube,insert the second dolphin then use the raster deform tool to move it around,then click the Move tool to deselect. If you used the picture that already had 2 dolphins no need for that second part. When you move your mouse up the left hand side you can see what the layers are. change the OPACITY,thats next to the eye..to 80. 8.Now goto LAYERS..NEW RASTER LAYER. Now click in the background fill properties. 9.Now click on the TEXT TOOL. Now type in your text,then use the MOVE TOOL to place it in the oval where you wish. 10.Now goto VIEW ..PALETTES ..LAYERS. Move your mouse up the left hand side just before the eyes to discover which layer has the name on it. When you know which one it is,Right click on it,goto DUPLICATE,then left click. 11.Now open up the ANIMATION SHOP 3. 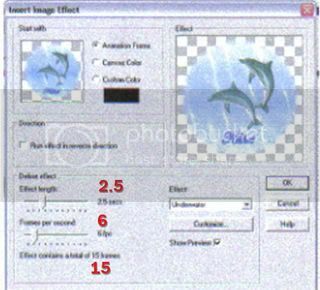 12.Set the EFFECT as UNDERWATER. EFFECT LENTH 2.5 FRAMES PER SECOND 6. Then make these the settings. then make the wave 2 settings this. 14.Then make this the third wave settings. 15.You should now have 16 frames. Push the left arrow on your keyboard till you get to FRAME 1. Make sure the red and blue layer is around FRAME 1 and no other. Then click the delete frame Red X. 15.You should now have 15 frames. Click to view the animation,then save it. so many hugs and smoochesto you!!! !